Pastry 2: Puff panoply - Do You Know The Muffin Man? We made three different products today, but most of it was just assembly. Chef began by doing a demo of making frangipane, a nut-based pastry cream. Equal amounts of fat (she used half butter, half shortening), sugar and ground nuts (half ground hazelnuts, half almond paste) were creamed together along with eggs and flavourings. All butter can be used too, but shortening helps keep the cost down. 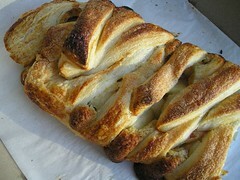 Some pastry flour helped to bind it together. The frangipane was to be used in place of bread crumbs in the strudel, and as a filling for turnovers. Next, we rolled out another 1/3 of the dough into a rectangle, this time 4:3. This was trimmed and cut into 12 squares. We eggwashed the edges of each square, placed a tablespoon of a filling (cherry, apple, frangipane) inside, and then set out to make various shapes: triangles are just the standard square folded along the diagonal; bear claws are made by folding along the horizontal, then cutting “claws” along one side; pinwheels are formed by cutting the dough from the corners towards the center, then bringing alternate tips to the middle; other shapes were made by cutting a corner or semicircle in the dough and folding it over, letting some of the filling peek through. We cut steam vents into the completely enclosed pastries. After an eggwash and dusting with sugar, these were ready to go into the oven. 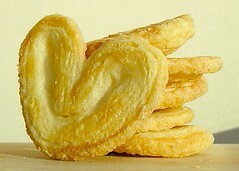 Finally, we made palmiers, also called palm leaves or elephant ears. Instead of dusting the table with bread flour, we used a generous amount of sugar. The 4:2 rectangle was folded up like a a book and flattened. Cutting thin cross-section slices, we fanned out the dough to allow it to spread. 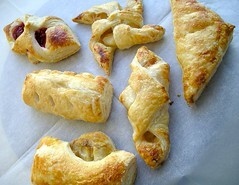 It's important to make sure the pastries are well-spaced, since the dough will expand sideways. Chef suggested that we could flip them during baking so that both sides get caramelized.